If the laptop, or the notebook is closed and you want to continue working right now, it is quite annoying when he goes into sleep mode, here is a simple solution for the problem under Windows 10, 8.1 and Windows 7! You don't have to resort to free software like DONTSLEEP for example. In Windows 10 you can change ergo customize the settings for your laptop or ms surface go and pro. 1.) ... Prevent hibernation / sleep when closing the laptop! 2.) ... Select what should happen when pressing the power button! ► Hibernation settings windows 10 ► Adjust screen brightness on Window-10 tablet PC via Mobility Center! 1.) 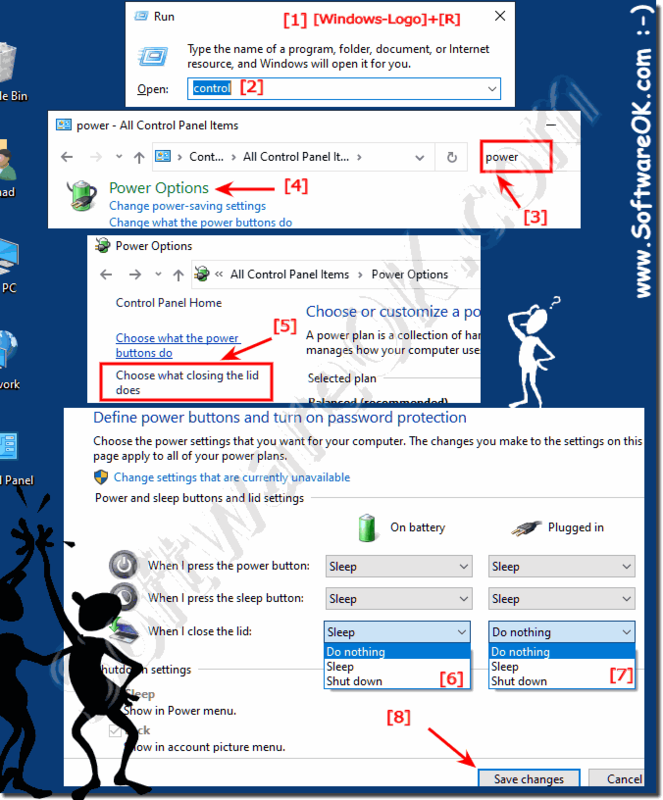 Prevent hibernation / sleep when closing the laptop! Please start the Power-Options in Windows 10 and change the settings for your laptop, the Power-Options you can also find in the windows 10 control panel. (Image-1) Laptop don't sleep when closed in windows 10! One of the most common problems with laptops is running out of battery power before you're finished using your computer. Battery Status in Windows 10 Mobility Center shows you how much charge is left in your battery and offers a quick way to change power plans so that your battery lasts longer. ► Disable auto sleep mode on windows 10 tablet PC, how to? ► Windows 10 remove frequent folders from explorer (quick access)? ► How do I set sleep mode in windows 10? ► Customize Recycle Bin in Windows 10, how to? 2.) Select what should happen when pressing the power button! At the same time you can set via what should happen when the power switch (... see Image-1 Point 4) , or the energy saving button is pressed! (Image-2) Power Button Action windows 10! The elegant solution to decide for yourself what should happen when the cover on the notebook or Surface is passed is written not only for Windows 10, as you can see above in Windows 10 shot screenshot, you can easy and simple use this example as a solution even on previous versions of Microsoft's Windows operating systems, not just to prevent the notebook / laptop from hibernating when closing or the lid, whether it's a plain Windows notebook, tablet PC, Surface Pro / Go, it really is very useful to have this free choice a simple, yet effective very useful function it has been tested on various MS-OS and successfully verified.